Articles - What is Colored Pencil Lead Made Of? What child doesn’t love coloring? It's a classic pastime for kids of all ages. Even today, adult coloring books are a popular go-to for lowering anxiety and curing boredom. Though, what's the best way to brighten those blank pages? You can choose from crayons, markers, or our personal favorite art medium, colored pencils. Join us as we take a deep dive into learning about colored pencils! What are colored pencils made of? Colored pencils do not actually contain any lead, which may be a surprise to some. Thin, precise, and easy to handle, colored pencils feature a wood casing filled with a wax or oil-based inside. Pigment is also added and mixed with water and bonding agents to create the rainbow of colors. There is no graphite in colored pencils. Two types of basic colored pencils exist: artist grade and student grade. As you can guess, the artist grade is higher in quality. The colors are more pigmented, and therefore, more vibrant. Artist grade colored pencils also have a higher resistance to UV rays, or lightfastness, which prevents fading. Overall, they are more durable and have a wider range of colors. Such quality is not typically needed in the student grade types since they are normally used in classrooms or for every day, informal use. There are two additional forms that exist but stray away from standard colored pencil manufacturing. Mechanical colored pencil are more similar to mechanical graphite pencils as they are just in color form. Watercolor pencils can be used dry like regular colored pencils or can have water applied on top for a watercolor effect. Unlike graphite pencils, colored pencils don’t smudge and are more resistant to water (with the exception of the latter two forms.) Standard colored pencils are easier to work with when it comes to precision and control. Though, as we’ve covered, they are not parallel to regular lead pencils in terms of the material makeup. With that being said, there are special techniques in properly taking care of these tools. Since colored pencils are often times made from wax, they are not typically meant for use in regular pencil sharpeners that are designed to cater to graphite. Since colored pencil lead is softer than regular graphite, it's easier to crumble and break, and is likely to stick to blades. Luckily, there are colored pencil compatible sharpeners that are designed to sharpen both forms of pencils with no problem at all. They feature non-stick blades to prevent build up. 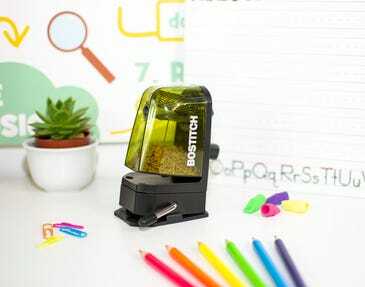 Great for the classroom or an at-home art studio, these specialty pencil sharpeners come in manual or electric forms, allowing you to take your coloring-book craze with you anywhere. What's your preferred coloring medium? It's a no-brainer that we love colored pencils (though, we may be biased.) Check out all of our coloring must-have products here! Take a look at the video below for a more detailed, visual breakdown of how colored pencils are made!